If you have lived in Denver or along the front range of Colorado for any period of time you know snow in May is not uncommon at all. So on the morning of May 1st two years ago looking out the window while working I decided to grab the camera and explore while the snow was falling. As the weather had been warm the past few days there was not much snow sticking to the pavement however the grass was starting to get some accumulation. I drove towards Washington Park and I had a location in my mind which I had photographed a few months earlier. Driving south towards the park I noticed the steam coming off of Smith Lake at the north end of park and quickly changed my destination. 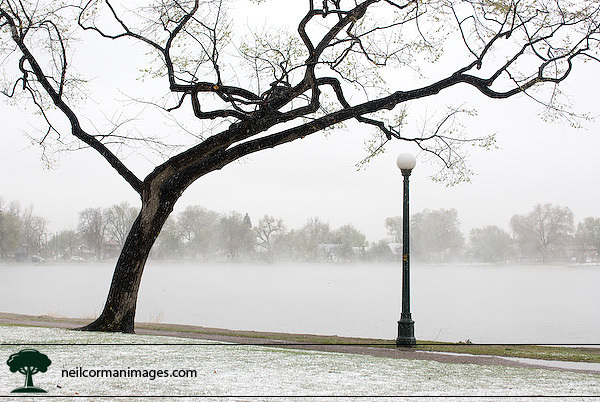 I started to walk around the lake and capture the elements of the snow and steam coming off the lake. I had almost walked the entire lake when I found an interesting tree which I didn’t recall the other times I was in the park. Walking back from the tree I liked how it framed the scene of the lake and light post and made the Snowy May Day photograph. One comment I get with this image when someone looks closely is that the photo itself is color. Depending on the size of the image, the first thought which goes to their mind is that the image is black and white until they notice the grass in the image. This is not the last you will see of this tree in the Behind the Picture series.